Our BEST SELLING sail intended for the serious sea-kayaker. 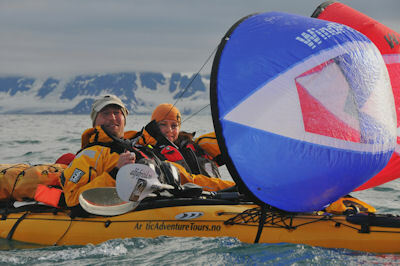 This is the sail for expeditions on big water and will be pulling hard long after you are ready to head to shore. The “Adventure” will withstand any condition you throw at it. The sturdy and unbreakable perimeter batten maintains sail shape in high winds and allows for high sailing angles. -Sails (reaches) off-the-wind up to an 180 degree angle or more. We developed the WindHarness which allows you to quickly attach your WindPaddle onto any boat or switch between boats in seconds. If your boat has anything that can be clipped to - including deck lines, cleats, bungees, pad eyes, fairleads, thwarts, handholds on the gunwale or bench seat - you can probably attach your WindPaddle to it!